Coming from a family of Steel dealers, the dynamic duo of Arun Gupta & Deepak Gupta, third generation entrepreneurs themselves, started M/s. 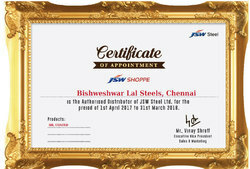 B. L. Steels, In the year 1991, christened Bishweshwar Lal Steels, in the year 2011. Starting off with stocking and trading in TMT Bars, we established ourselves as one of the reputed suppliers of steel in the Ambattur area, our USP being "Right Quality and Right Quantity" saw us grow in strength. Being a client centric organization, we cater to a wide segment of Hot Rolled Plate, Hot Rolled Coil, Mild Steel Angle at market leading prices. We have successfully developed a respectable position among our clients due to our relentless efforts in ensuring quality and quantity.